It’s mysterious lack-of-website aside, Altered Effect is quickly becoming a design company. Which is cool! Design can be fun — and, you know, suspenseful. Clients are definitely clients, but like many I suffer an urge toward diversity in task. Am I traveling toward a lopsided portfolio, if ever one exists? Will I lose credibility when it comes to programming complex web-systems and sweet interfaces? It could happen — though, frankly, I doubt it. It would surprise me if many noticed or cared. Still, it’s time to get more programming contracts if I can figure out how. That being said (up above, in case you missed it), I am very confident in my ability to program, less so to design. So all this design is hopefully a good sign! 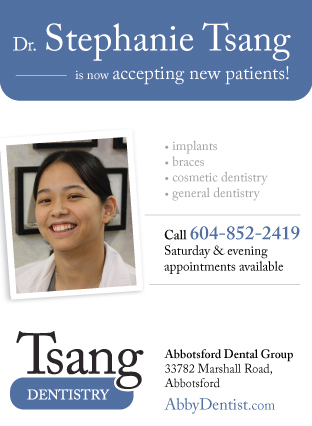 Above is a newspaper ad for Dr. Stephanie Tsang of Tsang Dentistry. It still needs some work, I need to play around with it a bit, but that should be pretty much it. Hopefully it is clean and clear, and attracts the eye in print. I’ve never designed anything for a newspaper before and can’t be sure what it will look like. How much would you charge for coding a routing public transportion wiki backed by data from openstreetmap.org? Pssh, you’re an excellent programmer. I think you hit the nail on the head though by saying “if I can figure out how” to get said programming jobs.